Add a bit of the eastern seashore to your bird garden with the Home Bazaar Blue Nantucket Cottage Bird House. Placing a decorative bird house in your backyard helps you create a theme, while providing songbirds a wonderful shelter. The soft blue color, large, pitched roof, and white trim add fun architecture to your yard, enhanced even more by fabric flowers beneath the two faux front windows. A 1.25" diameter entry hole rests on one side of the roost, so birds can easily access the cavity. Its generous size is perfect for an entire avian family, perfectly meeting the needs of your feathered friends. The pitched roof keeps rain out of the home, and its wooden shingles and center dormer further the realistic look. Two holes on the base allow any captured water to drain, while ventilation gaps beneath the roof overhang help the home stay cool for nestlings. A bit of screen beneath the entry hole acts as a ladder, for birds to reach the exit when ready, and the wooden body aids in keeping the internal temperature regulated. The wide, flat base of this unit allows you to mount it to a post or pole using a mounting plate (not included), or you can affix it to a wall or tree with the attached hanging tab. The back panel removes with ease for nest checks or cleaning, helping you keep the home safe for your birds. 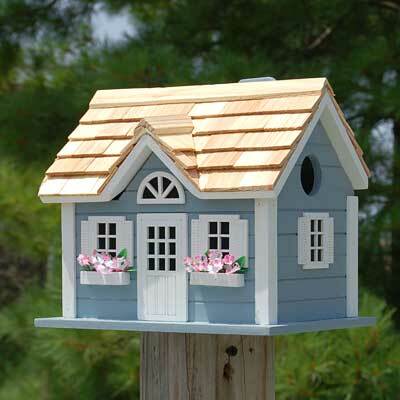 Bring classic style and bold color to your yard with this Blue Nantucket Cottage Bird House.